This is a development of 12 homes let at affordable rents to people with a connection to the village of Mark. This is a development of 12 homes let at affordable rents to people with a connection to the village of Mark. The scheme provides a mix of 1,2 and 3 bed homes including apartments, bungalows and houses, which allows for movement between properties as and when people’s circumstances change. Developing a mix in this way enables residents to remain in the village. The scheme was originally brought to the Society as a community land trust. Sadly, the governance structure collapsed, however the Society continued to work with the local people who had worked hard to identify the site. In conjunction with them, and the parish council, the development was completed in September 2018. One young tenant moving in with his family declared it a ‘good start’ in a property that is spacious and light. The need was identified by local people concerned about the lack of affordable housing in a village where average house prices require a mortgage of 9 times an average income for the area. 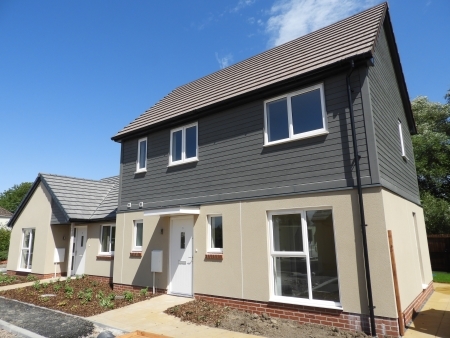 Working with the District Council, various public meetings were held and a housing need assessment carried out that determined a need for 12 affordable homes in the village. This development is an exemplar of collaboration between local people, elected members, the local authority and the housing association and its constructor. Each party shared the same vision and kept communication channels open throughout. The parish website was used to provide updates to all villagers. In addition, with no gas to the village, the Society invested capital in ground source heat pump technology, which will have a positive environmental impact on the area as well as seeing running costs reduced for new tenants. The scheme attracted Homes England funding of £18,500 per home. Sedgemoor District Council funded £245,000 from commuted sums to support the construction. The variety of designs sits neatly into the Northwick Road landscape. This has been a key project for the village providing much needed affordable rented homes, the first to be built for many years. We wish the new residents all the best for the future.